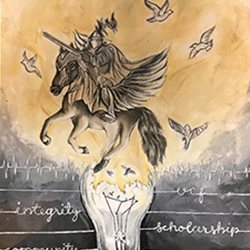 The Office of Student Rights and Responsibilities hosted its 5th year of the UCF Creed Art Contest. The theme for this year’s contest was: UCF Creed- Make it Shine. Thirteen talented students submitted art that was judged by the Office of Student Rights and Responsibilities staff. A second place winner was selected through fan voting on the UCF Cares Facebook page. View all artwork . OSRR thanks the UCF Parent and Family Fund for direct support with the first and second prize-an iPad Pro and iPad, respectively.